The quality of surface water depends on the combination of natural properties, conditions of self-purification of water bodies, and the input of contaminants from ambient environments. Hydrochemical and hydrobiological parameters are the main characteristics for water quality assessment. They are measured at the network of observations sites in accordance to a standard procedure, as well as by sanitary-epidemiological organizations and appropriate agencies. Water quality is one of the main parameters of human activity, and it is strictly regulated in Russia and other countries. Exploitation of water bodies for different economic purposes is stipulated by several standards defining the list of chemical and biological elements in the water and their permissible concentrations. The water designated for household and recreational purposes has the strictest requirements to the water quality. The standards for water bodies designated for fisheries are less strict and used in comparative assessments of the quality of natural waters. Qualitative characteristics of surface water summarised from the territorial reports are presented in the form of a map “Quality of surface water”, whose scale and information fullness are determined by the size of the lake’s catchment area. The original information for this map was taken from the governmental reports “On the state of Lake Baikal and measures for its protection” of the Republic of Buryatia and Irkutsk oblast, “Annual report on the quality of surface waters of the Russian Federation”, and the data provided by Mongolian scientists [National …, 2012, 2013; National …, 2013; Annual …, 2012]. To assess the state of water bodies, a specific index of water pollution (SIWP) was calculated from the most common contaminants of surface waters (see Methodology Instructions RD 52.24 643-2002). Water quality was assessed using SIWP and, as a result, five classes (categories) of water quality were identified in the examined water objects. The water quality in the basin of the Selenga (the largest tributary of Lake Baikal) on the territory of Mongolia was classified according to the procedure similar to the Russian one. The main list and standards of chemical elements (dissolved oxygen, suspended particles, acidity, etc.) are almost identical for both countries [The harmonised monitoring program…, 2012]. The final classification of water bodies of the Selenga basin on the Mongolian territory was based on the calculated values of the water pollution index [Davaa, http://fofj.org] and brought into conformity with Russian classification. On the map, the water quality classes of water bodies are depicted by colored lines and supplemented by marks showing the places where samples of chemical elements that were the main pollutants for the given segment of the water body were taken. In the lake’s catchment area, the integral characteristic of the quality of surface water varies over a wide range from “conditionally clean” to “dirty” preeminently due to the different levels of economic development of the region. 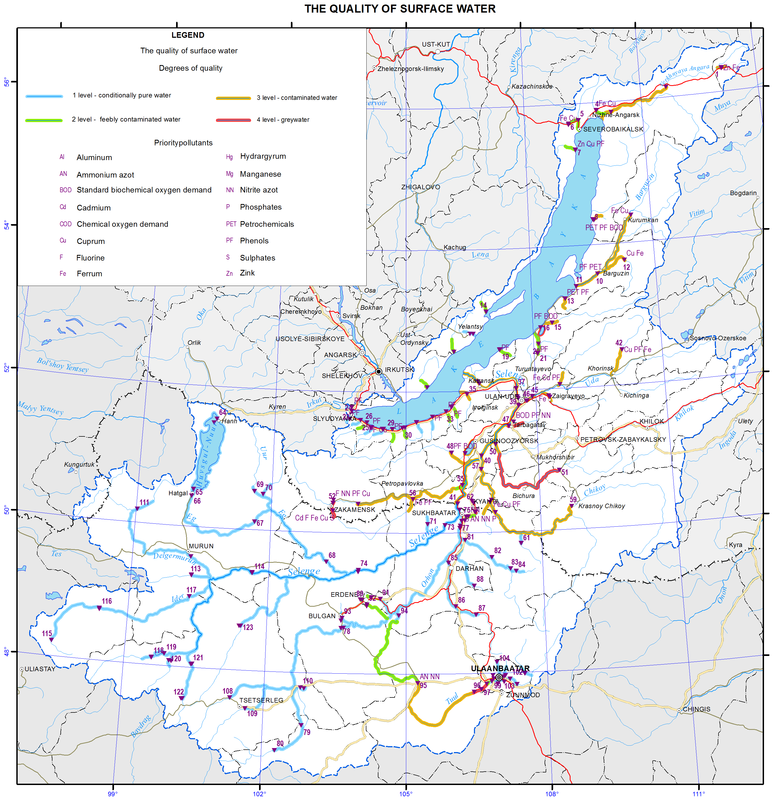 The major part of the lake catchment area belongs to the Selenga basin; the upper and central parts of the river are in Mongolia. The Selenga and a number of its large tributaries mainly cross underdeveloped territories and are not subject to significant pollution. The main large rivers of this area (the Delger-Muren, Ider, Orkhon, and Selenga) are characterized by high environmental indicators and practically pure (Class 1). The water in some areas of the hydrographic network of these streams that are adjacent to developed regions and subject to anthropogenic effect belong to Class 2 (“slightly polluted”). The Tuul river experiencing a severe anthropogenic impact (around Ulaanbaatar) significantly differs from other streams on the Mongolian territory: its surface water quality is classified as Class 4 (“dirty”). The main pollutants of this river are ammonium and nitrite nitrogen, phosphate, and sulphate. However, due to its self-purification processes occurring in the mouth area at the confluence with the Orkhon river the Tuul river water recovers to Class 1. The water in the Khiagt river on the northern border of Mongolia is also of low quality. This river brings its Class 4 waters to the territory of Buryatia (the Kyakhtinka river). Relatively low characteristics of the water quality (Classes 2 and 3) are recorded in some developed areas – in the Khangol (the town of Erdenet) and Orkhon (the town of Sukhbaatar) rivers. Up to the confluence with the Orkhon, the water quality of the Selenga in Mongolia is regarded as Classes 1 and 2. Further, below Sukhbaatar and the Orkhon’s mouth, the Selenga crosses the border to Russia. In Buryatia, its water quality is classified as Class 3 (“polluted”). The main pollutants of the river at the cross-section of Naushki are compounds of aluminium, iron and copper, the values of which exceed maximum permissible concentrations. Furtheron, the Dzhida river (together with the Modonkul river – Class 4) and the Kyakhtinka river (Class 4) join the Selenga. The first one is affected by the discharges of mine and drainage waters from the non-functional company JSC “Dzhida Combine”, while the second one contains elevated maximum permissible concentrations of 11 elements due to the transboundary transfer (the Khiagt river). Large tributaries of the Selenga joining this river downstream bring polluted waters of Class 3. The most unfavourable situation is observed at some sites of the rivers Kuitunka, Chikoy, Khilok, and Uda, whose water quality is regarded as “polluted”. The main pollutants are different forms of nitrogen, organic substances, and phenol. The water in the lower Selenga is characterised as Class 3. The quality of surface water in other largest tributaries of Lake Baikal is also low. Such large rivers as the Upper Angara, Barguzin and Turka have polluted waters of Class 3, whilst the water in smaller rivers such as the Tiya, Kholodnaya, Kika, Snezhnaya, Utulik, Buguldeika, and other are of Class 2. Phenols in combination with oil products, zinc, copper, and organic substances are typical contaminants of these rivers. There is a scarce information on water quality in the lakes located on the examined territory as no monitoring has been conducted there. The exception is Lake Gusinoe, whose water quality is of Class 3 (“polluted”). The main pollutants of this lake are phenols, oil products, copper, and other substances. Moreover, the lake is subject to thermal pollution from the Gusinoozerskaya Thermal Power Plant. Another water body, Lake Kotokel, located within the Baikal basin has a very low water quality. The use of its water is prohibited for any purposes, except for technical use, which is confirmed by Decree No. 4 “On the Initiation of Restrictive Measures at Lake Kotokel” of the Chief Sanitary Inspector of the Republic of Buryatia, dated June 6, 2009, [On the state of …, 2013]. It should be noted that against the backdrop of the increased water discharge into water bodies of this territory in 2012, there is a trend of significant improvement of surface water quality of the Baikal basin. The water quality indicators in the majority of water bodies have been improved by 1-2 classes as compared to 2011 and previous years (On the state of …, 2012, 2013; Annual report …, 2012). The Sochava Institute of Geography SB RAS. (2013). On the state and conservation of the environment in Irkutsk oblast in 2012: State report. Irkutsk: The Sochava Institute of Geography SB RAS. p 337.